Slots.lv is a U.S.-friendly online casino that welcomes members from around the world. The casino offers a fantastic game selection as well as lucrative bonuses and an excellent rewards program. Click here for your $22 FREE CHIP from Slots.LV Casino. Redeem Your Slots.LV Bonus Code Here! Would you like to experience Slots.lv with no money down and absolutely no risk? Well, you’re in luck. Simply register a new valid account, and then, redeem the coupon code SLOTS22. The casino with credit your account with the $22 bonus immediately. You can use the bonus however you please, but there is a 100x playthrough requirement and only wagers on slots, keno and scratch cards count toward it. The bonus is cashable, but winnings are capped at $125, and anything beyond that is forfeited. Click here to redeem Slots.LV bonus code SLOTS22. Once you’ve played through your no deposit bonus, if you decide that Slots.lv is for you, then you can take advantage of the welcome offer. The minimum deposit at Slots.lv is $20. Use the coupon code HELLOSLOTS200 to have your deposit matched by 200 percent up to $1,000. So, if you deposit the minimum, you’ll receive a $40 bonus, and you’ll need to deposit $500 to claim the maximum. Click here to redeem Slots.LV bonus code HELLOSLOTS200. The standard wagering requirement for deposit bonuses at Slots.lv is 35 times the bonus plus the deposit used to claim it. This applies to the initial deposit bonus discussed above as well as the bonuses we’ll explore in the three sections to follow. Let’s say you made a first deposit of $100 and claimed a $200 bonus. Zeroing out your account meets all obligations, but if you come out ahead, you’ll need to play through ($200 + $100) x 35 = $10,500 before you can make a withdrawal. Once you’ve met that condition, the bonus is cashable and there’s no limit on cashing out. Not all games contribute to the rollover requirement equally. Wagers on slot machines, keno, scratch cards and all specialty games do contribute 100 percent. Most table games only provide 20 percent, which would effectively increase the requirement example above to $52,500. Blackjack and video poker bets count for only 10 percent. Baccarat and roulette count for only 5 percent, and craps bets don’t count at all, which means that you can’t actually use bonus money on craps until it’s played through at least once. If you’ve played through your welcome bonus, Slots.lv offers the HELLOSLOTS100 code, which matches your deposit by 100 percent up to $500. The promo code HELLOSLOTS200 can be used only once, but HELLOSLOTS100 can actually be used eight times. For the average gambler who places nine $20 deposits, that’s a $2,000 bonus, and high rollers can max this promotion out with a whopping $5,000! If you prefer to use bitcoin over credit cards, e-wallets and the like, then Slots.lv has a special promotion for you. Note that this doesn’t supplant the welcome package described earlier. You could take advantage of either one in any order. We highly recommend using the Bitcoin deposit method because there are no deposit or withdrawal fees AND payouts are MUCH FASTER! Use the bonus code SLBITCOIN300 when making a bitcoin deposit of at least $20 and Slots.lv will match it by 300 percent up to $1,500. So, a deposit of $20 — about 0.0043 BTC at the time of this writing — would get you a $60 bonus or 0.013 BTC. Deposit $500 or about 0.1086 BTC to receive the maximum of $1,500 or about 0.3259 BTC. Click here to redeem Slots.LV bonus code SLBITCOIN300. Slots.lv also offers the coupon code SLBITCOIN150, which you can use after SLBITCOIN300 and up to eight times. This promotion matches any bitcoin deposit of at least $20 in value by 150 percent up to $750. Maxing out both SLBITCOIN300 and SLBITCOIN150 would net you $7,500. As a new depositor, you’ll have access to Depositor Rewards. Once you’ve accrued 2,000 Reward Points, you’ll upgrade to Signature Rewards. You’ll earn one Reward Point each time you wager $1 on slots or $4 on any other casino games. You do earn partial credit, so if you spin 50 cents on one slot machine and then 50 cents on another, that would earn you one RP. For every 10 RP you earn in a given month, you’ll receive an entry for a draw to win a $1,000 grand prize or one of four $500 secondary prizes. Your status is based on your activity for the previous month. If you earn 5,000 RP in September, you’ll have Superior Rewards status for October, and you’ll need to accrue 5,000 RP again that month in order to maintain it in November. MySlots Rewards status is simply a matter of reaching an RP milestone until you get to the VIP tiers. You can’t access VIP Rewards and VIP Premium Rewards until you’ve made $10,000 and $25,000, respectively, in total deposits. 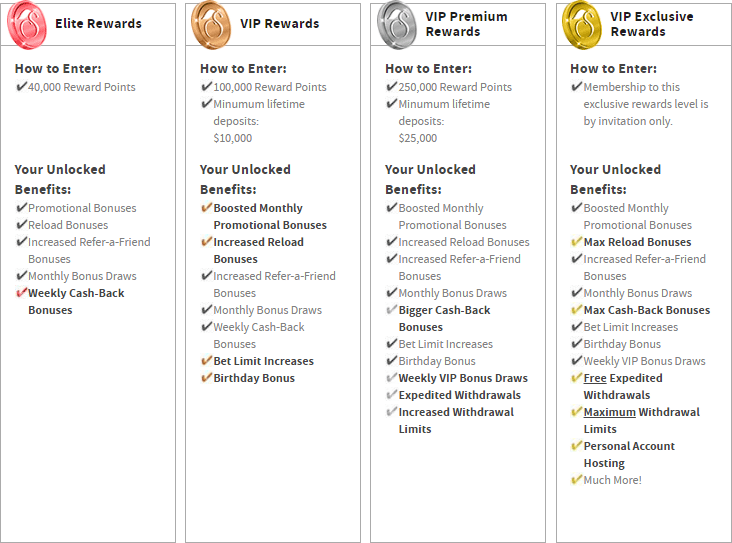 The VIP Exclusive Rewards status is earned by invitation only. The rewards available to you are more lucrative at each higher tier. At Signature Rewards, you’ll have access to reload bonuses, and those bonuses get bigger and more favorable as you rise in rank. At Elite Rewards, you’ll receive cash back each week. It begins at a 10-percent rate and can increase as high as 35. At VIP Rewards, you’ll have access to weekly drawings for a $1,000 prize, and you earn an entry for this drawing for each 10 RP you earned in the week leading up to it. Have a friend that likes slots too? Refer them to earn a free chip. If you have many friends, you’re in luck because there’s no limit to how many times you can claim a free bonus this way. When a referred friend makes his or her first deposit, Slots.lv will give you a 100-percent match up to $200. Better yet, if you’re at the Superior Rewards level or higher, the casino will give you a second bonus the next day that matches your friend’s deposit by 300 percent up to $300. This was the first casino that I played I won $1,800 on the 17th I have a check at my door on the 21st Amazing!!! Thr5 service has always been great I won with two other casinos one. I never got the money the other took 6 weeks. I haven't found anyone comes close to their service. I work in customer service so I know what constitutes good customer service. The games are phenomenal I recommend it to anyone keep up the good work guys? +1 208-262-1367. I have never cashed out at this casino but that's my fault I make small deposits of adv 30-40 usd and regularly rack up several hundred and a few times thousands but I just like to play more than dealing with the paper work bull this is a part of online casinos I hate but they are all the same so consitant points I guess .but the games are great and pleasant customer service techs make this and a few others I play at a joy so stop hating .